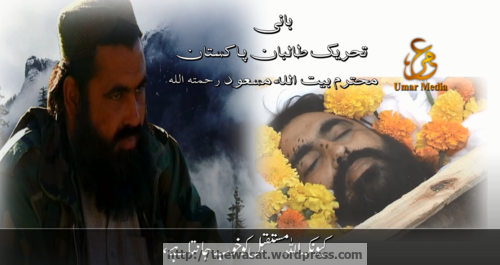 The late Tehrik-i Taliban Pakistan leader, Baytullah Mehsud. 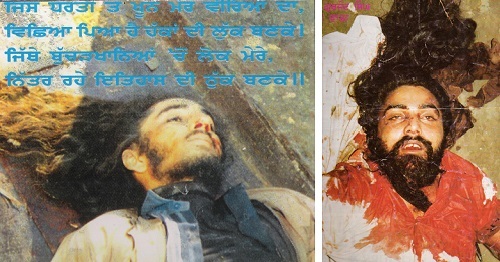 As far as I can tell, being linguistically and historically challenged, the gentleman on the right would be Gurjant Singh Budhsinghwala — perhaps someone can help me identify the gentleman on the left. I found the upper image in the same Visual References post from Chris Anzalone that I recommended recently in two comments here [figs 2, 3, 3B] and here. If you look closely — or is just my poor eyesight? — you’ll see the arm, fist and rifle to the left of the black banner in the upper half of the upper image. Black banner? Did I just say black banner? 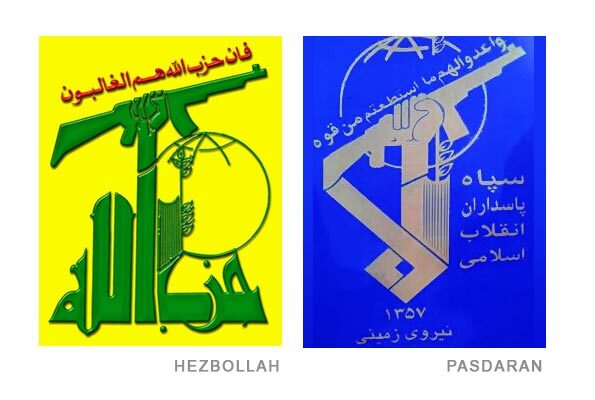 For those with the slightest knowledge about Hezbollah and the Middle East, I am not sharing with you something new, but for those who receive this information as a revelation, check out the resemblance between the emblem of Hezbollah and that of the Pasdaran, a.k.a Army of the Guardians of the Islamic Revolution. — Hezbollah emblem to the left in yellow. Pasdaran emblem to the right in blue. So what’s new? Why am I shedding light on what is already obvious? Why target Hezbollah today, out of all the parties that have been selling Lebanon? Today, more than ever, Hezbollah and Iran owe Lebanon an explanation. Take a look at the 10 Riyal postage stamp that is circulated in Iran. 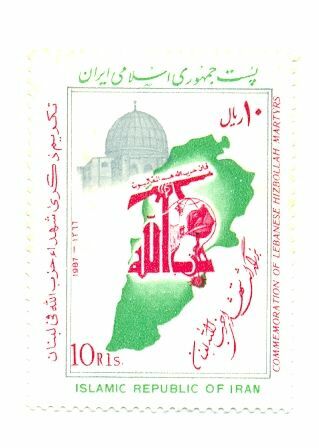 Iranian 10 Riyal postage stamp showing the emblem of Hezbollah covering the whole map of Lebanon. A clear symbol of the hidden intentions and a direct breach for the sovereignty of Lebanon’s independence as a nation. The stamp commemorates the martyrs of Hezbollah in Lebanon. Isn’t this an obvious breach of Lebanon’s sovereignty as a nation? I understand the bff relationship between Iran and Hezbollah, but why does Iran need to have Hezbollah’s emblem covering the Lebanese territories instead of the Lebanese flag? Why does Iran need to commemorate the Lebanese martyrs in the first place? What does Hezbollah have to say about this in the first place? 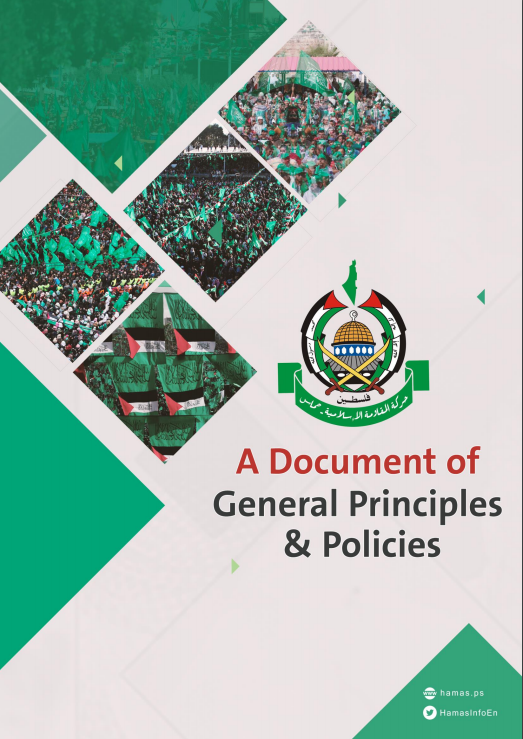 How can Hezbollah justify such a demeaning document? What can its big-bellied, tie-less MPs and representatives say to logically justify this? Will they even attempt to justify it, or consider it normal and not even worth concealing with the whole world’s knowledge of its non-matrimonial marriage to Iran. As a Lebanese, I ask my government (which is controlled by Hezbollah) to question the Iranian ambassador about the motives of this stamp and ban its circulation. As a Lebanese, I ask Hezbollah to denounce the usage and circulation of this stamp in Iran and ask the Iranian state for an apology to the Lebanese people and its government. That’s taken from a post made in January, but I think it is no less relevant today, and adds to the general picture I’m painting. Those groups influenced by Hizbullah &, by extension, Iranian Gov’t, seem to favor it, likely b/c it’s used by the Pasdaran. I stumbled across the DoubleQuote image and accompanying Lebanese Expatriate post myself, searching for the best image of a Pasdaran flag or logo while following up on Chris’ pointer to the Pasdaran — and that gave me yet another use of DoubleQuotes in the wild! Hat-tip, #FF and thanks, Chris! I’m bringing across two comments of mine from DoubleQuotes in the wild and making a separate post out of them — to give them more exposure, to emphasize the importance / interest of the two posts by Chris Anzalone that they are based on — and to be able to reference them in a post I’m currently working on. Both graphics are drawn from Chris Anzalone‘s Visual References post from last month, which gives essential visual support to his article, Zaynab’s Guardians: The Emergence of Shi`a Militias in Syria in the CTC Sentinel, just out. 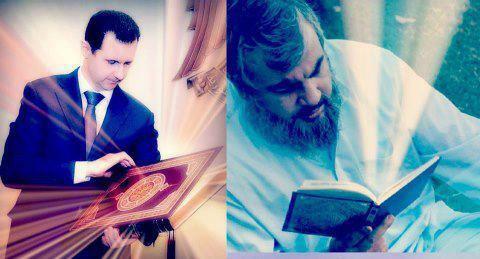 An Internet poster showing Hizbullah’s secretary-general Hasan Nasrallah (right) and Syrian president Bashar al-Asad. The photograph of Nasrallah was taken after the 2006 Hizbullah-Israel war and has clearly been edited to show light emanating from the book (presumably the Qur’an). The same is true of the posed image of al-Asad. Both are shown by the designer as pious (thus, presumably, deserving of support). This pair ties the piety of the politician with the piety of the cleric, making a conceptual bridge between both Lebanon & Syria on the one hand, and politics & religion on the other. Not terribly surprising, but still, cleverly done. 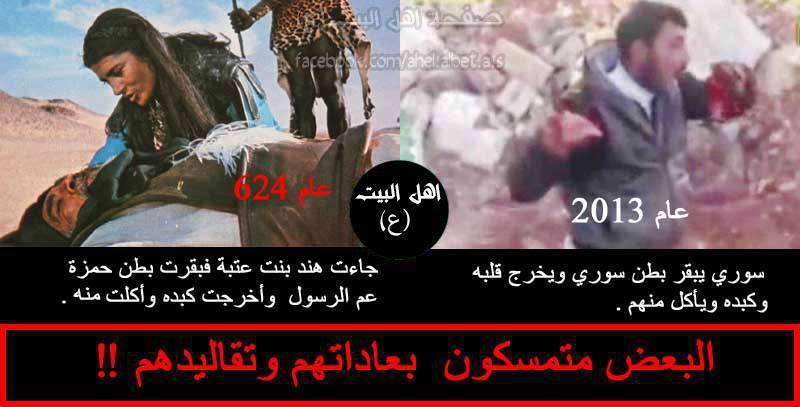 Internet poster comparing Abu Sakkar, commander of a Syrian rebel group, (right), who committed a politically symbolic act of cannibalism on video with an organ (said to have been the liver or heart) from a slain Syrian government soldier in May 2013, and Hind bint ‘Utba (left), one of the Prophet Muhammad’s most virulent enemies before his conquest of Mecca in 630 C.E. In some Islamic historical sources, she is said to have taken a bite of the liver of the Prophet’s uncle, Hamza bin ‘Abd al-Muttalib, who was also one of his greatest warriors, after the Muslims’ defeat at the Battle of Uhud near the city of Madina. The text at the bottom reads: “Some stick to their habits and traditions! !,” referring to Sunni Muslims. The image of Hind and Hamza is a still from Syrian film director Moustapha Akkad’s famous 1977 film The Message about the beginnings of the prophetic career of Muhammad, the founder of Islam. 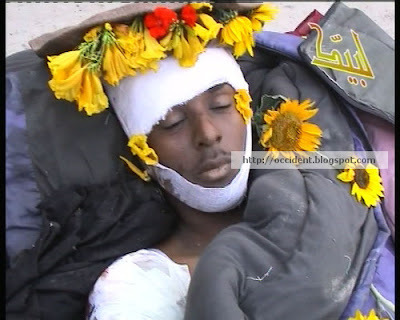 Akkad was one of those killed in a bombings of hotels in ‘Amman, Jordan carried out by Al-Qa’ida in the Land of the Two Rivers/Iraq, then led by Abu Mus’ab al-Zarqawi. Taken together, the two “doublets” linked to above can add rich spoils to our understanding of Shi’a contributions to what Chris calls “the increasing sectarianization of Syria’s civil war”. As you know by now, I am fascinated by the oblique-angled windows on current affairs offered us by mythology, folklore, iconography… and for the record, I’ll specifically include flags under iconography. The wolf (borz) is a potent national symbol, and its character traits are considered paragons to be emulated. 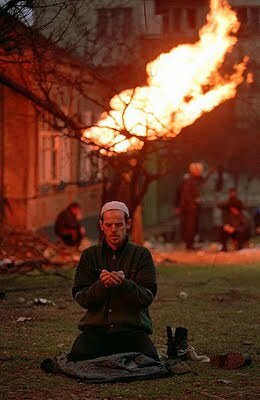 Chechen men would be proud to be compared to wolves. ‘He was nursed by the She-Wolf,’ is a compliment implying adroitness and courage. Legend has it that it was the wolf that redeemed the world by standing heroically in face of the fury unleashed on doomsday. According to the Chechen ethos, the wolf is the only animal that would enter into an unequal match, making up for any disadvantage by its agility, wit, courage and tenacity. If it loses the battle, it lies down facing the foe in full acceptance of its fate — Chechen poise equivalent to the famed British ‘stiff upper lip’. This wolfish analogy is a depiction of how the Chechens have dealt with outside invaders for millennia. According to mythology, god had created sheep for the wolf to enjoy, but man tricked it out of its ‘patrimony’, so it had to resort to ruse and robbery to reclaim its right. 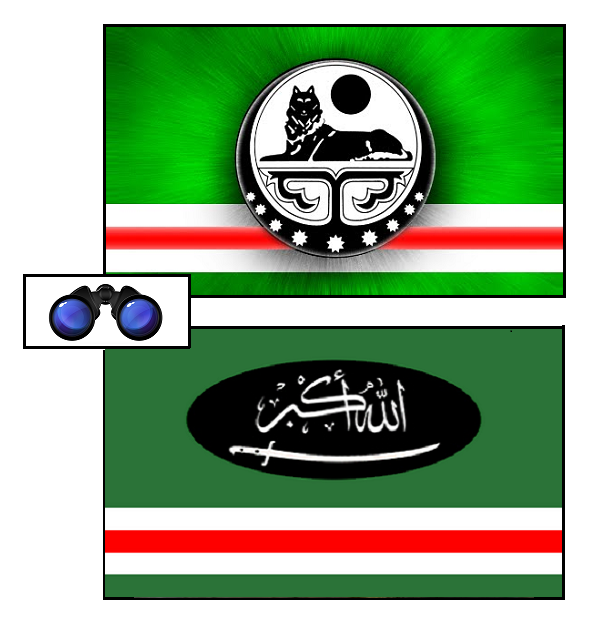 That’s Chechen wolf-imagery in the upper flag, above. Chechen men would be proud to be compared to wolves. Legend has it that it was the wolf that redeemed the world by standing heroically in face of the fury unleashed on doomsday. According to the Chechen ethos, the wolf is the only animal that would enter into an unequal match, making up for any disadvantage by its agility, wit, courage and tenacity. As to prayers, the use of the takbir, “Allahu Akbar” above the swords in the lower flag is part of the muezzin’s call to prayer, and recited during the prayers themselves. Analysts have tended to call such individuals “lone wolves,” in my view, a romanticizing term that suggests a cunning and deadly predator. A few of those recorded here display this kind of lethal determination, but others, while still dangerous, skulk about, sniffing at violence, vocally aggressive but skittish without backup. 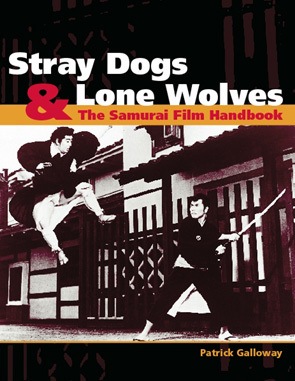 “Stray dogs,” not lone wolves, more accurately describes their behavior. If there were any doubts that lone wolves can be deadly, they were dispelled by Anders Breivik, the Norwegian anti-Muslim crusader who in July killed 69 young people in a coordinated attack using guns and a car bomb. But viewing them from outside, analytically, as lone wolves may give them too much credit; while classifying them as stray dogs neutered of religious ideology gives the Islamic element too little. Perhaps a new paradigm, one of roaming hyenas, best describes the Tsarnaevs — characterized by anomie (fitting into neither domestic nor foreign contexts), the ability to feign surrender when necessary, and a propensity for attacking only the defenseless. It’s a web-wild-world we live in!